If you have searched for ' Baby Names ' then "Congratulations" must be in order and our section on Pregnancy Stages might also prove helpful. Whether you are the mother or father of a new boy or girl, a member of the family, or a close friend, you are sharing in a major life event and taking a serious interest in choosing a special boy or girl name from one of the thousands of boy and girl baby names that are available. 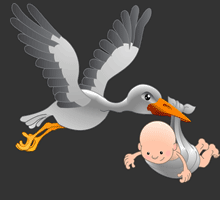 Check out the Baby Name Meanings and the Baby Names Dictionary! Each section has a unique list of a top babyname for a girl or boy. Top Babynames for a Girl and Boy: We have also included sections for the Parents! Check out the Baby Name Meanings, the Names Dictionary for ideas and inspiration for naming a newborn boy or girl. Each section has a unique girl and boy babynames list. Top Babynames for a Girl and Boy: A boy called Shirley? A Pensioner called Zowie? Choosing a suitable baby boy name or baby girl name from the vast selection that are available is a serious task. One of the cute, exotic or cool baby boy names or baby girl names may be great for a tiny baby. But would it have the same effect when the baby boy or girl grows into a schoolchild, a teenager, a young adult, a middle aged person and eventually a pensioner? Will the boy or girl, who has now become older, then be happy with your choice of name ? School kids can be merciless to each other and make a bee-line for anything out of the ordinary, unfortunately this includes boy or girl names which are unsuitable for older children. Remember - 'A Name isn't just for a Birth Day - it's for life'! The images at the top of the page reflect the different life stages that a boy or girl can travel through - from a pram to a bike to a car and beyond! We hope to make you aware of any possible pitfalls in determining your full baby's name. No visitor to this site will make the mistake of selecting the like of Helen Hywater (Hell and High water), Tom Katz or Diane Decay ( Die and Decay). Yes, they are all real names!. We also look at popular baby names - those that can be described as ' faddish ' names. Ideas for the unusual boy names or unusual baby girl names come into fashion but these types of names can just as quickly go out of fashion! Fashionable types of baby names are chosen because they are unusual, but they then become a trend. As soon as the trend is identified people move away from using them! These fashionable, or faddish, types of baby names can ' date ' a person. This Babynames Site Map gives a comprehensive guide to the contents of www.babynames.org.uk. All baby name lists have been divided into female and male baby names. We hope that you find our vast range of over 50,000 boy and girl baby names helpful and ease your difficult task of choosing the best possible name for your newborn baby. Our survey into naming a boy or girl established that the information required included classic, unusual, unique, exotic divided into a list of girl and boy names. Many people requested boy or girl name meanings and origins and were interested in ascertaining the most popular boy or girl names and how these have changed through the course of time. Many visitors requested that each boy and girl name section was accessible on one page. Name searches also included requests for the top names for boys and girls. A list of names for a boy or girl for what seemed like every county imaginable were also high on people's list of priorities - in fact a World of Babies Names ! The world of Babynames section enables an easy search for a unique list of babynames from different countries all around the world. This section not only contains a unique list of top English babynames for a boy and girl but also details the meanings and origins of English babynames and many of their origins. This section contains a unique list of top American babynames for a boy and girl. In the most recent years many of the traditional American babynames have been replaced with more exotic ideas and a number of popular babynames have been taken from the names of states or cities within the United States of America. This section contains a unique list of top black babynames for a boy and girl. These wonderful and unusual babynames encompass a new type of naming system for black babies making use of the prefix of 'La' or 'Le', as in Latoya, Lashawn, Latrice etc) and the also the prefix of 'Da' and 'De' as in Denelle, Danisha etc. creating totally unique babynames. Many of the top black babynames for a boy and girl have been also been inspired by the African roots of their families. This section contains a unique list of top Italian babynames for a boy and girl. The Roman Catholic church encouraged the use of naming many Italian babies after Saints and biblical characters from the New Testament. This section contains a unique list of top confirmation names for a boy and girl. In many English and German speaking countries a special confirmation name is chosen for a person being confirmed in the Roman Catholic Church. A confirmation name is usually adopted from the name of a saint as a protector and a guide. This section contains a unique list of top French babynames for a boy and girl. French babynames are unusual as they often feature the use of hyphens. Examples of male hyphenated babynames are Jean-Jaques or Paul-Henri. Examples of female hyphenated babynames are Anne-Marie or Marie-Elise. This section contains a unique list of top Indian babynames for a boy and girl. These babynames are also accompanied by meanings. Separate sections have been provided for Sikh and Hindu babynames. This section contains a unique list of top Greek babynames for a boy and girl. Many religious babynames are given in Greece and many other traditional babynames taken from Greek mythology and culture. These names would include those of mythical heroes and such as Odyessus, Alexander and Helen. This section contains a unique list of top Spanish babynames for a boy and girl. We have also provided a unique list of Hispanic babynames. A Hispanic person is someone of Latin American descent living in America. especially one of Spanish, Cuban, Mexican, or Puerto Rican origin. This section contains a unique list of top Irish babynames for a boy and girl. Irish surnames reflect the Celtic roots of the Irish. The prefix "Mac", means 'son of'. This section contains a unique list of top Shakespearean babynames for a boy and girl taken from the famous plays written by Shakespeare. The popularity of Shakespearean babynames have increased as celebities, like the Beckhams, drew inspiration from the great Bard and named their son 'Romeo'. The result of our research is the content of this website. We hope that you will find our version of baby boy names and girl names interesting, rare, unique and fun. We hope you will be able to select the best names and be able to make your own unique decision. Why unique? Because only you will be aware of the full name for your baby boy or girl, including the first name, middle name and surname. Your complete baby's name, taking into consideration, the baby's first name and last name are crucial as a combination to your final name selection! The Top 100 Baby Names Lists are compiled at the end of every complete year by the Social Security Administration in America and the UK Government. It's interesting to see which names have made the Top 100 Baby Names Lists for the current year. How does the most recent Top 100 Baby Names Lists compare with your choices? What influenced the content of the Top 100 Baby Names Lists? And what will influence the Top 100 Baby Names Lists for future years? Who were the most popular celebrities for the year? Movie Stars? Pop Stars? Models? Celebrities? They always influence the Top 100 Baby Names Lists to some degree! Top Babynames for a Girl and Boy: What else is available? Different and unusual facilities have not been forgotten. Take a look at the Baby Name Evaluator! These are totally exclusive to our visitors - and completely free of charge! 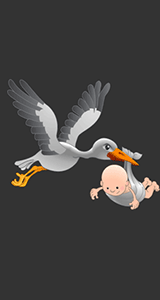 Announce the birth of your newborn baby boy or baby girl to everyone on the Internet and send automatic e-mails with the great news to your friends and family - it's the fastest way to spread the word! Top Babynames for a Girl and Boy: Family Search? Yes, we also have a section on conducting a Family Search - Genealogy! Meanings and origins of First, Middle and Surnames! Genealogy has become a very popular pastime with the advent of the Internet which has made a World wide search to document a family tree much easier. We have a whole section dedicated to the subject of Family Names. This important section of the website features the subject of Genealogy which includes a helpful section on how to make a start on a Family Search ! The interest in tracing family roots has also brought about a great interest in naming babies which reminds people of the ' Old ' Country. A really interesting fact is that 80% of Americans can trace their roots to the U.K. and Census records from the UK can now be accessed online, making the process of tracing family histories much easier. Have a go at completing our exclusive Names Quiz Game! It's free, it's fast and it's fun!Can you beat your family and friends? Have some fun with the Chinese Pregnancy Calendar! The Chinese Pregnancy Calendar was a method of predicting the gender of a baby. The ancient Chinese Pregnancy Calendar is believed to date back to the 13th century. There is no scientific evidence to support this method, but due to the laws of probability it will always have a 50% success rate! So have some fun and use this ancient Chinese Pregnancy Calendar! Our Day by Day and Week by Week Pregnancy Stages can be used as a guide to help you understand the changes in your body and to your baby. There are facts, information and helpful tips about each of the trimesters.